Marian Dingle is an amazing presence in this community. Everyone please take a moment and thank her for being an incredibly patient and persistent voice for marginalized communities. Every time she reaches out to me I am so appreciative that she thinks of me as someone worth having conversations with, and worth continually prodding to use my privilege in positive ways. Tina, you titled this post Dr. Danny Martin, why are you talking about Marian Dingle? Because, dear reader, the most recent message I got from Marian was about Dr. Martin's NCTM talk. 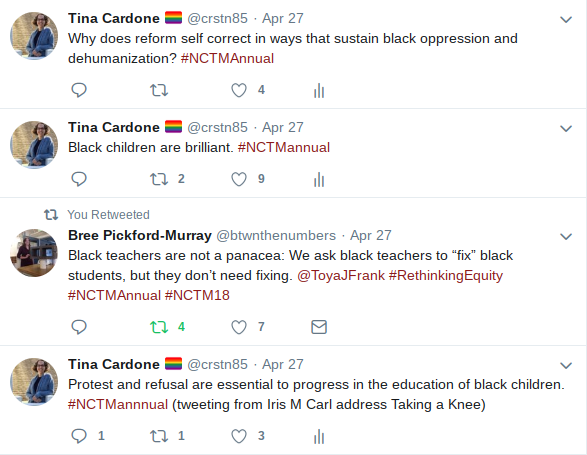 I said these things, I posed that huge question that really made me think (Why does reform self correct in ways that sustain black oppression and dehumanization? ), and then I jumped on to the next thing. I listened, but did I really hear? I certainly didn't spend the time to do a deep reflection of my role in this message. Marian popped up in my messages to ask the question, why aren't people talking about this? And I decided that we could and should fix that. So, I'm inviting anyone who wants to join the conversation to read Dr. Martin's book The Brilliance of Black Children with us. I don't have a plan, but Annie Perkins (@anniek_p) has made the generous offer to get us organized. For now, I'm going to continue adding people who express interest to this post and update it as we make more plans. Please comment or tweet to let me know you'd like to join in so we can keep you in the loop!